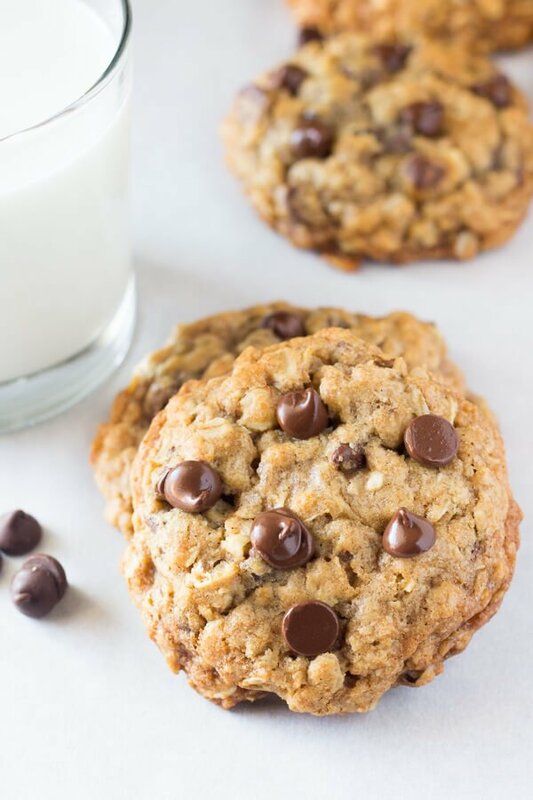 I’ve shared my favorite Oatmeal Raisin Cookies and these delectable Chewy Chocolate Chip Cookies – so I figured it was time to combine the best of both worlds & make Soft and Chewy Oatmeal Chocolate Chip Cookies. Now, I realize some people have an aversion to oatmeal cookies. And if that’s you – I recommend getting your priorities are in order. 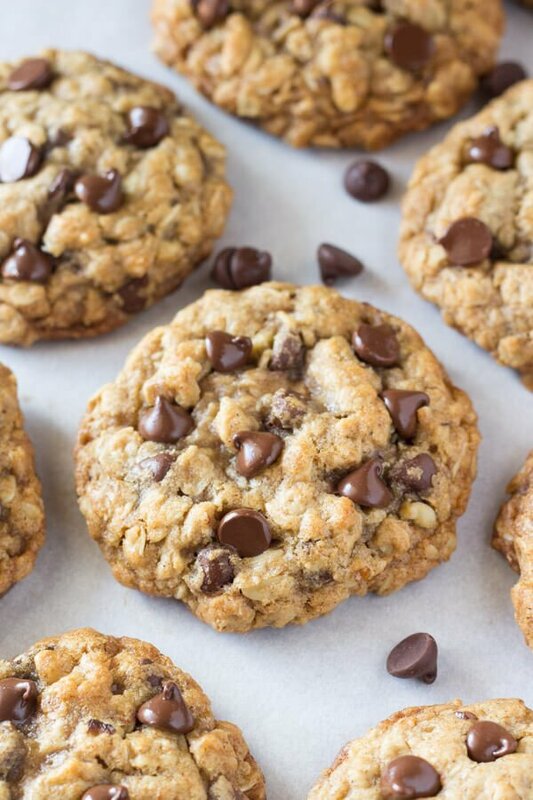 Because oatmeal chocolate chip cookies are just plain delicious. 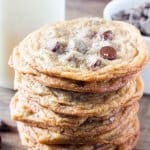 They’re full of texture, infused with cinnamon and vanilla, ridiculously large, and dotted with melted chocolate chips. 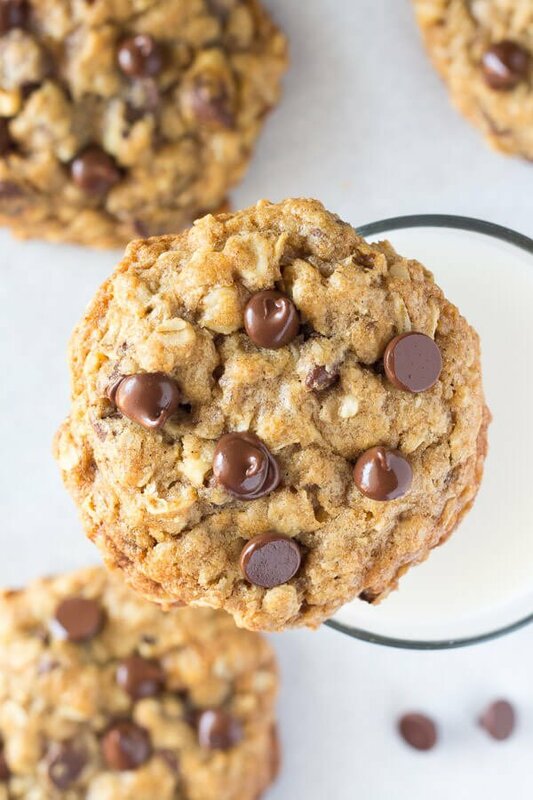 Seriously, you can’t go wrong when you fill a cookie with oatmeal, chocolate chips and walnuts. 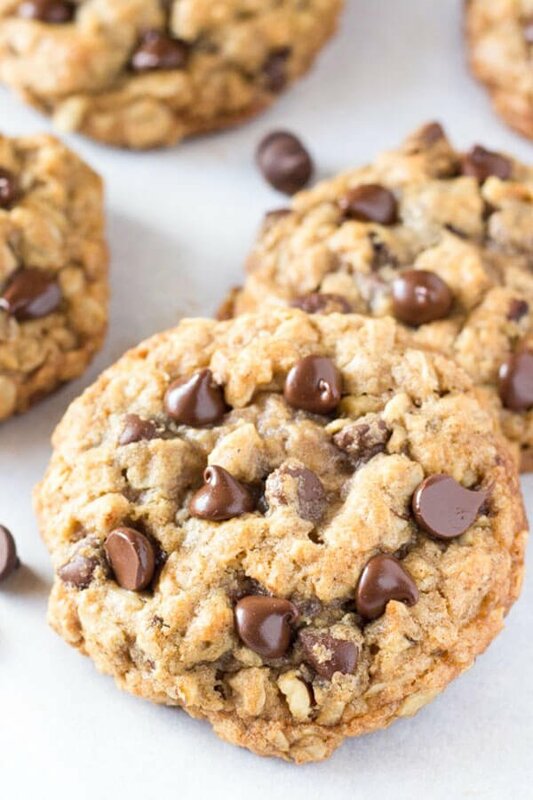 So what makes these soft and chewy oatmeal chocolate chip cookies perfect? 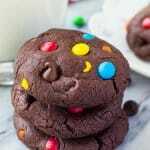 Now, even though these cookies are just as fantastic as the ones from your favorite bakery or coffee shop – the recipe is straight forward. First, we’ll beat together the melted butter, sugars, honey, vanilla & egg – then the flour, cinnamon, baking soda, and salt are mixed in. Finally, we’ll stir in our key ingredients: old-fashioned oats, chocolate chips & walnuts. The cookie dough comes together in less than 15 minutes and then it’s time to chill the dough. Because we’re making very soft, very chewy, ginormous cookies – it’s 100% necessary to chill our cookie dough prior to baking. Otherwise the cookies spread too thin and loose their chewiness. 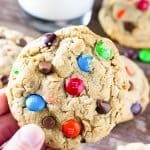 I like to use a 1/4 cup dry measuring cup or an extra-large cookie scoop to form the dough into balls, then set the cookies on a plate, cover with clingfilm and refrigerate for at least 2 hours prior to baking. After chilling the dough, the cookies are baked for about 12 minutes. 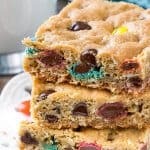 Then for the final touch, I like to dot the tops of my cookies with a few extra chocolate chip for a professional look and cookies that just scream “EAT ME”. Why did my oatmeal cookies spread too thin? Usually it’s one of a few things. Either not quite enough flour, too much butter, not chilling the dough for long enough, placing the cookies in an oven that’s not fully preheated, or not lining the cookie sheets. Why did my oatmeal chocolate chip cookies turn out dry and crumbly? This is usually caused by too much flour. Before measure, whisk the flour. Then spoon it into the dry measuring cup and level off the top. 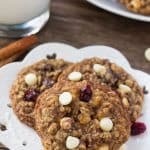 Can I use quick oats in oatmeal cookies? 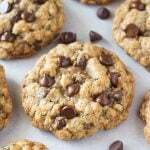 For this recipe quick oats are ok – but since quick oats behave a bit more like flour, I recommend using 2 cups quick oats instead of 2 1/4 cups old-fashioned oats (like is written in the recipe). Can I use instant oats in oatmeal cookies? I don’t recommend using instant oats because they’re too fine. Therefore you don’t get the chewy texture of oatmeal cookies and they can turn out dry. Can I use steel cut oats in oatmeal cookies? Steel cut oats are much harder than rolled oats. You won’t get that chewy oatmeal cookie texture, but instead will have little hard bits in the cookies. I therefore don’t recommend using steel cut oats in this recipe. Can I use margarine instead of butter? I don’t recommend it. Margarine doesn’t have as much flavor and typically the cookies spread too much. In a large bowl whisk together the flour, cinnamon, baking soda & salt. In a separate bowl beat together the melted butter and sugars using an electric mixer. Add in the honey, vanilla and egg and continue beating until combined. Turn the mixer down to low and beat in the flour mixer until almost combined. Add in the oats and beat on medium speed until combined. Then turn off the mixer and stir in 1 cup of the chocolate chips and the chopped walnuts. Form the dough into balls of about 1/4 cup . Flatten slightly, set on a plate and cover with clingfilm. Refrigerate for at least 2 hours. When you're ready to bake, preheat the oven to 350F degrees. Line your baking sheets with parchment paper or a silicone baking mat and place the cookies at least 2 inches apart. Bake for 12-14 minutes until the tops of the cookies look almost set. Remove from the oven and dot the tops of the cookies with the remaining 1/4 cup of chocolate chips. Allow to cool on the cookie tray for 10 minutes before transferring to a wire rack to continue cooling. These are now my husband’s favorite cookie! Thanks for a fantastic recipe! Wow amazing recipe ,, thank you so much for sharing . Just for us in the UK ,please note baking soda is the same as bicarbonate of soda ..
Can I add raisins to this without changing the rest of the recipe? These were fantastic!! Thanks for the recipe. A favorite FOR SURE! These are MY Staple go to Cookies every single time!! This recipe is PURE PERFECTION!!!! You & Everyone else is going to LOVE them! !